The Long-Putt putting green is a 6' x 60' putting and chipping green. It's two-piece construction provides unmatched versatility and improved portability. Big Moss signature long-putt greens are the industry-leading long-putt surface and are used all over the world in long-putt contests and trade shows. Made from premium industrial grade materials, this green can withstand heavy foot traffic and never develops grooves. It cleans up with a vacuum cleaner. 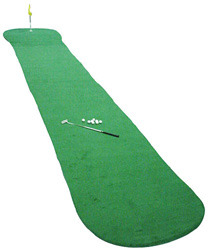 Attract overwhelming crowds at your next trade show or long-putt contest. If you have any questions regarding the Big Moss Long Putt 60ft Putting Green, please give us a call, we would be happy to help you with any questions you may have. Write an online review on the Big Moss Long Putt 60ft Putting Green, and share your thoughts with others.